It is notoriously difficult to establish the causal relationship between house prices and borrowing. 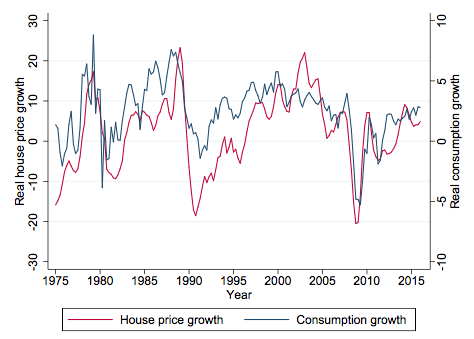 House prices are strongly correlated with household borrowing and consumption over time. This co-movement has existed for a long time (Figure 1) and was especially strong at the time of the Great Recession. It has inspired the narrative about the Great Recession that house price swings caused changes in borrowing and consumption during the 2000s (e.g. Mian and Sufi 2011, 2014, Mian et al. 2013, Kaplan et al. 2015). The link between the housing market, debt, and consumption has again taken centre stage in the policy debate. Source: Cloyne et al. (2017). But do house prices drive borrowing, does borrowing drive house prices, or are there other confounding factors that drive both? It is notoriously difficult to establish the causal relationship between house prices and borrowing, and Figure 1 does not have a causal interpretation (Campbell and Cocco 2007, and Attanasio et al. 2009 and 2011). In recent work (Cloyne et al. 2017), we revisit the questions of whether and why rising house prices drive household borrowing. To identify whether there is a causal relationship, we need to find a setting where house prices change for quasi-random reasons, unaffected by other factors that might influence household borrowing. Much of the recent research has used variation in house price growth across regions, but there may be other factors that vary across regions and influence borrowing. 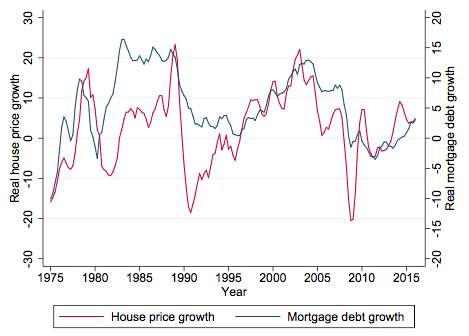 Instead, we use a large regulatory dataset on individual house prices and borrowing decisions in the UK. We find that a 10% rise in house prices leads to a 2% rise in equity extracted. We then shed light on why this might be the case. Using a variety of empirical methods, we argue that the effect of house prices on borrowing can largely be explained by a 'collateral effect'. This means that when house prices rise, the collateral value of the house increases. Since banks are more willing to lend to households with high collateral, higher house prices make it easier for households to borrow. Individual variation in house prices are taken from lenders’ mortgage appraisals. This detailed information allows us to conduct clear graphical analyses, for which we do not need to make any technical assumptions on the relationship between house prices and borrowing. Long-term fixed interest mortgages are typically not available in the UK. Most homeowners refinance at regular intervals, every few years. We therefore observe repeated borrowing choices over time for the same household. This allows us to ensure household-specific factors, such as preferences over how much risk to take, do not bias our analysis. 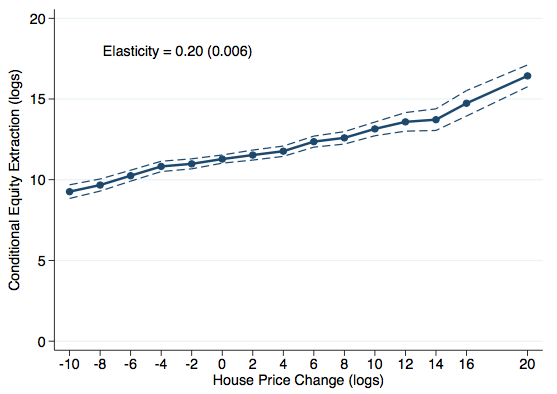 The institutional setting in the UK helps in identifying quasi-random house price changes. Most mortgage products have a relatively low interest rate for a short period, typically two to five years, followed by a much higher reset rate. This setting creates a strong incentive to refinance around the onset of the reset rate. It implies that the timing of any refinancing is determined by past mortgage contract choices. These three elements, combined with the large aggregate house price swings over the period, create quasi-random variation in individual house prices. Households faced very different house price shocks depending on whether they refinanced before, during, or after the Great Recession. The timing was determined largely by a mortgage contract choice that had been made in the past. Do house price changes drive household borrowing? 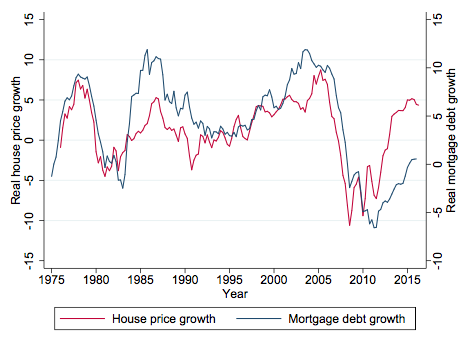 We first establish a causal relationship between changes in house prices and borrowing. This relationship is interesting in its own right, but also indicative of the potential consumption effect of house prices. 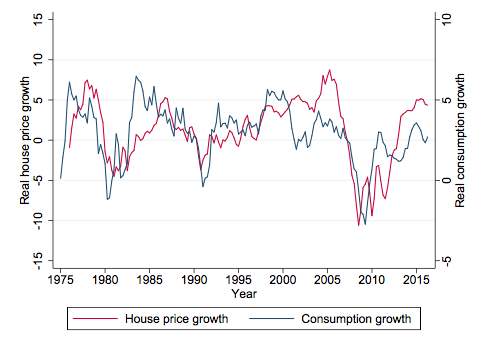 We find clear evidence that house price appreciation induces homeowners to increase borrowing. On average, a 10% increase in house prices led to a 2% rise in equity extracted. An important finding is that the relationship is remarkably linear. This means, for example, that the change in new borrowing is similar whether the house price increased by 10% or fell by 10%. The empirical techniques underlying Figure 2 ensure that a range of other factors do not bias the analysis. For example, we account for the fact that different households refinance at different times, live in different places, and may have different preferences. In addition, we can ensure that confounding regional shocks, such as shocks to the expected income of households in one region, do not affect the analysis. Why do house price changes drive household borrowing? Wealth effect.Households' perceived wealth increases, inducing them to borrow and consume more. All else equal, the wealth effect should be larger for older homeowners. They are more likely to cash in on their housing wealth, because they expect a shorter lifespan. Collateral effect. It is easier to borrow more when the house becomes more valuable, because lenders accept the higher value of the house as collateral. The collateral effect should be larger for homeowners with higher leverage (ratio of the loan value to the house price). Banks do not tend to lend to households with high leverage, so highly levered households are more dependent on the collateral they can use to get a loan. Research has tried to distinguish between different mechanisms by comparing old versus young households and high- versus low-leverage households (Campbell and Cocco 2007, Attanasio et al. 2009, 2011). A challenge, however, is that different dimensions of heterogeneity are highly correlated. 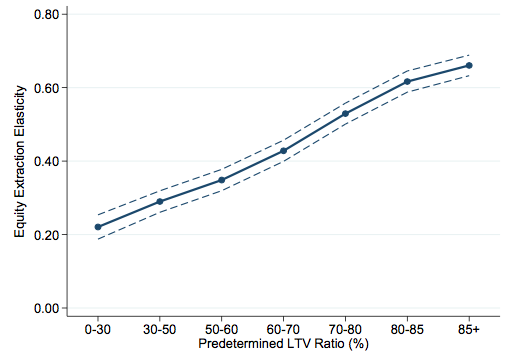 For example, older homeowners are on average also less levered, so it is not clear if the age profile is picking up wealth or collateral effects. We resolve this issue by studying how the effect of house prices varies with respect to each factor, while adjusting in a detailed way for differences in other relevant factors. We consider four factors simultaneously: leverage, age, income, and income growth. Remarkably, we find that there is essentially no difference in the effect of house prices with respect to any factor except one – leverage – but the effect of this factor is very strong (Figure 3). 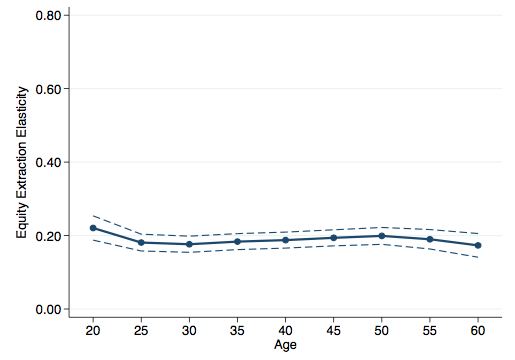 In contrast, the age profile is completely flat after controlling for the other relevant factors (Figure 4). The collateral effect therefore seems to play a crucial role in driving the effect of house prices on borrowing. The Great Recession reignited an important debate over whether house prices drive household borrowing. The first generation of academic papers studied this question using regional data in the US and found strong borrowing responses. Our paper uses rich data and the unique features of the UK mortgage market, and finds a clear and robust effect of house prices on borrowing: a 10% rise in house prices led to a 2% rise in the amount of equity extracted. Much of this relationship can be explained by the collateral effect, in that higher house prices enable households to borrow more, because lenders accept the increased value of houses as collateral.